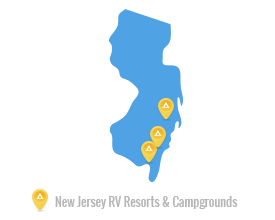 RVontheGO’s New Jersey RV parks capitalize on the Garden State’s beautiful shoreline, a feature that continues to draw visitors to the RV campgrounds in New Jersey year after year. Speaking of years, all of the RV campgrounds are open year-round in New Jersey for travelers that want to experience the change in seasons. Whether you’ve come for the sun and the sand, or a quiet respite by the water and woods, a stay in New Jersey and our RV parks is sure to delight. RV campgrounds are available in New Jersey’s small seaside towns within the Atlantic City - Cape May region. New Jersey RV parks feature swimming pools, family entertainment, and some even host festivals and holiday events throughout the year.